The Broken Ear (1937) is the story of a thrilling pursuit. Tintin sets off to South America to retrieve a stolen fetish. There, all sorts of interests are in conflict: military, economic and the war of the Gran Chaco which had been opposing Bolivia and Paraguay for the past three years. A small Arumbaya statue has been stolen in a museum, then returned. One little detail though will tell Tintin that instead of the original, a mere replica was returned. There must be a secret hiding behind this small statue since its robbery was carefully concealed. This is in South America that Tintin will find the key to this enigma. The Broken Ear is the sixth adventure in the Tintin series, and the first version of the album - in the 'Tintin reporter' style with grey endpapers and a small picture glued on the front cover - is without doubt one of the most rare and sought-after Tintin books on the collector's market today. The blue endpapers first appeared in 1937, under the initiative of Charles Lesne, who thought them of better quality. Although blue endpapers were applied to the books during the first print run of The Broken Ear(from the time in 1937 that Tintin in the Congo and Tintin in America were being reprinted), it seems that grey endpapers were added to the book for the first few copies. This is why they are so rare! The plot of The Broken Ear revolves around the theft of a statue from a museum. Tintin is on the case, which will ultimately lead the little reporter deep into the heart of the Amazonian jungle. A story that begins with intrigue and simple detective work unexpectedly develops into a madcap and nail-biting adventure. The mysterious and coveted Arumbaya fetish is in reality a small pre-Columbian statue that belongs to the Royal Museum of Art and History in Brussels. The origins of this statuette are far removed from the Amazon region: it comes from the area surrounding the city of Trujillo in North Peru. The real museum piece does not have a broken ear, while the only way of telling the "real" statue in the story, is precisely by its broken ear! The San Theodoros portrayed in The Broken Ear and Tintin and the Picaros, is first and foremost a symbol of the instability and violence that has gripped South American politics for so long, as well as a model of a poor city in the third world, ravaged by brutal power struggles masked as ideological conflicts. The Broken Ear plays out as a kind of ?naïve documentary based on the Western perception of South America in the 1930s. (Philippe Goddin, Hergé et les Bigotudos, Casterman, p.15). Hergé addresses the archetypal aspects of twentieth-century Latin America: revolutions, coups, arms dealing, smuggling and corrupt business. Ironic comic or playful parable? Hergé takes up the theme of the reports he read in Le Crapouillot magazine, which he turned to for information: dictators and puppet governments of banana republics, manipulated by international trade, arms dealers, and the military and industrial ambitions of world powers such as the United States and Great Britain. It is these big players that are behind the coups, revolutions and wars. The name of the liberator of San Theodoros, General Olivaro (1805-1899), is a clear allusion to General Bolivar, liberator of the Spanish colonies to the north of South America, which formed what was called the Gran Colombia. Hergé thinly disguised the inspiration behind his character Mazaroff (in the black and white French version), who was renamed Bazaroff in the colour version. The real-life character was called Basil Zaharoff (1849-1936), and Hergé found out about Zaharoff in Le Crapouillot. In another reference to real life, Hergé alludes to the Gran Chaco conflict (1928-1935) between Bolivia and Paraguay. The Gran Chaco region was split between the two countries. Hergé had already written about oil in Tintin in America and would return to the theme in Land of Black Gold. In 1932, the skirmishes that had so far characterised the Gran Chaco conflict made way for official declarations of war between Bolivia to Paraguay. The war would finally come to an end in 1935. A treaty ratified on 21 July 1938 attributed the main region of the contested territories to Paraguay while conceding access to the Paraguay River, to Bolivia. Hergé loved wordplays and thinly disguised this real-life conflict under the name Gran Chapo (meaning 'big hat' in English): San Theodoros (capital city Las Dopicos) masquerades as Bolivia (capital city La Paz) while Nuevo Rico (capital city Sanfacion) plays Paraguay (capital city Asuncion). The aircraft in which Alonso Perez and Ramon Bada travel to South America, is a Breguet Wibault-Penhoet 283 - a tri-engine Air France machine - that is easily distinguishable by its landing gear. The winding mountain road that Tintin drives down following his escape from General Alcazar's jail, exists in real life. It is La Yungas Road, the infamous Bolivian 'road of death', built during the 1930s by Paraguayan prisoners of war. Tintin's car careens over the edge of the mountain, although the little reporter manages to jump clear at the last moment. Tintin's journey through this territory begins when he jumps from a bridge into the river making up the border between Bolivia and Paraguay. The little reporter then arrives at Don José Trujillo's hacienda, and later leaves by canoe in search of the Arumbayas. 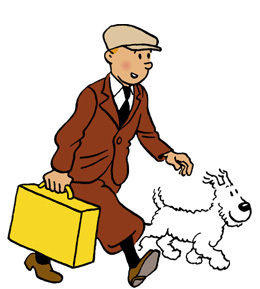 In the issue of Le Petit Vingtième published on 5 November 1936, Don José explains to Tintin that: "The last man to try was a British explorer, Ridgewell. He went more than ten years ago. He's never been seen since." Hergé was inspired by famous real-life British explorer Lieutenant Colonel Percy Fawcett, whose last letter to his wife was dated 29 May 1925. Fawcett became Ridgewell, gaining skills in the use of a blowpipe while in the process of transformation. In the heart of the Amazonian jungle, Tintin meets Ridgewell and the Arumbayas in the same place where British explorer Percy Fawcett disappeared in 1925! The Arumbayas, who speak disguised Brussels dialect, are similar to the real life Jivaro Indians, and have the Rumbaba tribe (who specialise in shrinking heads) as enemies. The Arumbayas live on the banks of the River Coliflor in San Theodoros. For his research, Hergé turned to Travels in the Americas (1875) by A.J. Walker, the same book that Tintin consults while investigating the theft of the fetish. A lot of iconic imagery in this adventure: Tintin playing Alcazar in chess, the indigenous jungle folk attempting to play golf, and of course the majestic parrot that also works as a great plot device. But Herge made some mistakes. For instance, one of the indigenous tribes wore sashes of navy blue color, which certainly looked strange. But the biggest mistake was in the album title, which totally spoils the reader from himself taking on the role of investigator. A better title would have been Tintin and the Arambaya Idol. The lettering is offset too far to the right and falls outside the speech bubbles. Please fix. Good but why only in 4 Language? German, spanisch, italian, swedish? Simply superb! Glad for this new set of digital editions!